Double Trinity with Saint Augustine and Saint Catherine of Siena, by Cuzco School, c. 1700-30. Museo de Arte de Lima, Lima, Peru. Mind you! We don’t actually call the Holy Family the Earthly Trinity. There’s only one Trinity, and that is composed of God the Father, Jesus the Son, and the Holy Spirit. 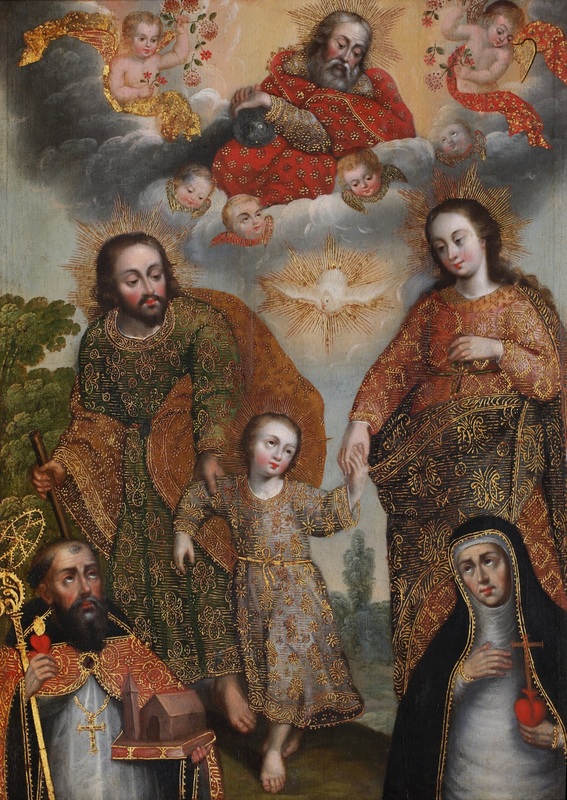 However, it can be useful to look at the similarities between the Holy Family and the Trinity. We, as Christians, like to constantly talk about the fact that God is love. It’s written in our scripture and, in a world that talks constantly about romance, it can be wonderful to remind ourselves that the silly romances that we are constantly surrounded with are just that — silly. And that God shows us what real love is. One way that God does this is by the Holy Trinity. God is not just this Cosmic Being who is alone by Himself. He exists as Three Persons in one as the Trinity. How does this happen? It’s a mystery! But, we can explain why it happens… it happens because God is love! And love must have not only a giver but a receiver as well. So all three parts exist in a communion of love with each other. It is because of this mutual love that the entirety of creation is able to come into being! Jesus also becomes man because of love! Frequently in pictures of the Annunciation, there are depictions of God the Father and the Holy Spirit descending upon Mary as a dove. And, because of Mary’s loving acceptance — her Fiat — Jesus is able to become man. A new Adam — a new Creation! Once more, love creates something so wondrous and miraculous that it takes away our breaths. Then, when we look at images of the Holy Family, we are reminded once more that Jesus surrounds Himself with love at the very onset by having both a mother and a father who love Him deeply and do their best to raise Him up in a godly manner where God is first and foremost in their lives. And this too is a creative act that all of us parents would do well to look at and emulate. It is not enough for a man to merely be conceived — he must be raised in a loving way to be able to fully reach who he is called by God to be. And that’s first and foremost the task of the parents who have been entrusted to this child by God — be it from a natural blood connection or by adoption. So, God sets us as an example by having Jesus raised by the Holy Family. With Jesus, Mary, and Joseph, we can see what real love in action looks like. This, in turn, can help us understand what sort of love exists between the Holy Trinity — even though it remains a mystery for us, it helps us recognize and appreciate the total self-giving and sacrifice that love requires. Does that mean that everything in the Holy Family was always wonderful? Probably not! Messiness happens. Yet, there was love. And, as the phrase goes, ubi caritas est vera, Deus ibi est. As you look at this picture, what is the first thing that seems to pop out at you? Look at Mary’s, Joseph’s, and Jesus’s expressions carefully. What sort of thoughts do you think are going through their minds as they enjoy being with each other? In what ways are the Holy Trinity and the Holy Family similar to each other? In what ways are they different? Help us form our own relationships and families based on Your love, keeping God always in our minds. Help us forgive each other when we need to and love each other, even when it becomes hard.